Well, the day has finally arrived! My kids are both back in school and I'm at home all by my lonesome self :( part of me wanted this day to come, because they drove me nuts during the day but now I miss them, Lol! On the upside, I have time to actually get housework done & they are having fun learning, making friends & having fun....lol! 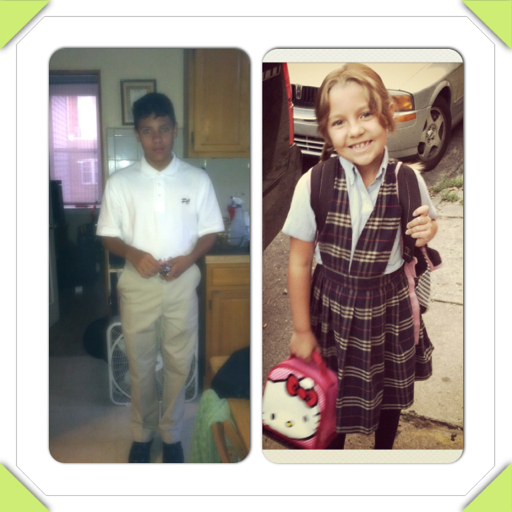 My son's first day was yesterday but today was the real deal...all students had to report in full uniform. He was very happy with his experience yesterday, he had a great time so hopefully its the same today! My daughter's first day is today & she was really excited to be there! She woke right up at 5:30am & dressed herself....no problems what so ever....yay! Wouldn't it be nice for the rest of the school year to run as smoothly as today? Hahaha, this behavior may last until tomorrow....Monday may be a completely different monster!